Hi guys/girls. 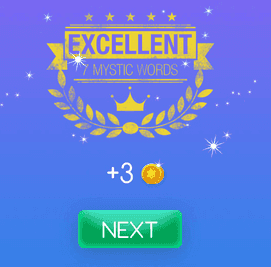 Welcome to Mystic Words White level 3 answers. Remember to look only the answers to the clues you are blocked. There is no fun if you see all the answers before trying to solve them first. A periodic celebration 8 letters answer, click here! The act of stretching 7 letters answer, click here! A cat with a pink bowknot 5 letters answer, click here! A place contains books 7 letters answer, click here! Accompany with stars 4 letters answer, click here! The “E” in CEO 9 letters answer, click here! Any distinct time period 5 letters answer, click here!